We recommend this feature for Power Upload users with advanced Excel users, familiar with using complex formulas and data management features for 'Quality Assurance & Control' during self-loading metadata. This will prevent specific other users from changing your security settings without asking permission, protecting the confidentiality of your client’s documents. If you've never uploaded metadata before, you should plan sufficient time to meet any production or document deadlines, including ours and your quality control procedures. If you can't upload productions or metadata using Excel spreadsheets and you believe you should have administrative rights to the account, please contact the Account Admin User(s) of your account. Please note that users must not only have administrative rights to the account, but also request 'for Power Upload' by submitting a ticket at our support center. Please upload our sample of a file mapping Excel spreadsheet to a test case, before creating and uploading your own! >Only someone with advanced Excel skills should have this right. >Don't add any letters, spaces or characters to the file name extension ''.lexbemultidocupdate.xlsx'' (e.g. 'Lexbe.lexbemultidocupdate.xlsx02.xlsx' or 'Lexbe_01 Production.lexbemultidocupdate.xlsx'). Those type of file name extensions if not saved exactly according to our instructions, might not load the metadata properly. >You should practice with a test case you create (administrators for an account can create new cases) to make sure you understand how this feature works before using on live data. >You should do a test upload into a live case of a few records (Excel rows) before uploading a large spreadsheets (many rows) so that you are sure the the data is doing what intend. >A backup of the state of the records to be changed should be created before each update operation and retained locally, so that if a mistake is made the data is available to revert. >We do not have the ability to revert your data if needed (unless you have saved an Excel with all previous entries). >You are responsible for your own quality control and to check to determine that changes were made as you intended. For a variety of reasons, including multiple Excel versions, many data types, unsupported characters, and system design limitations and possible bugs, you data might not update as intended and you should check it after upload. >Because this functionality involves advanced Excel skills, we cannot support this feature with our support department. We do offer training and support though our Technical Services, but there is a per hour charge for these services. Once you are granted 'Power Upload' privileges, you will upload the Excel spreadsheet with the metadata from the Case> Add Case Documents, just like you upload other documents in Lexbe eDiscovery Platform (no special keys/buttons). Follow these steps to update Metadata and other coded data in a Lexbe eDiscovery Platform case. These instructions assume advanced Excel skills. >Select the columns (fields) you plan on modifying from the 'Columns>Show Fields' section. Some of the Built-in Doc Fields are read-only and cannot be modified (see list below); therefore, you don't need to export. >Save the Excel sheet to your local computer. NOTE. Make a backup copy of this file and save it. Have the name include the date and time downloaded and an indication of what records are included or how they were selected. An example would be 2013-05-20 Smith vs. Jones Case, All Responsive documents.xlsx. >The file must be in an Excel format with an XLSX extension, supported by the last two versions of Excel (2010 and 2013). Older Excel formats (e.g., XLS) or other Excel formats such as XLSM are not supported. >A key use is using Excel's 'copy down' functions to do massive Row copies. Other useful features are the formulas in Excel and Excel's complex filtering and sorting functionality. >No Excel formulas are supported on upload, so any use of Excel formulas should be converted to values. >When populating data to check-boxes fields (Custom Doc Fields), you must use 'Yes/No' values and also have the option to remove the main case section. For example, the main case section 'Deponents' has two check-box fields titled 'Mark' and 'Tobey'. In Excel you can remove the 'Deponent's' column and keep only the check-box fields to apply massive tagging. >Remove the bates attachment range fields (BatesNumberAttachment Start and BatesNumberAttachment) and keep only the headers 'BatesPrefix', 'Bates' and 'BatesNumberDigits'. >The 'Bates' column indicates the beginning numeric portion of the Bates designation. You can also use text formula/functions to extract the Bates from files that are saved with their Bates names, and then values pasted in place of the formulas. >Please allow a couple of minutes for the metadata to be processed and uploaded. >After the upload is complete go to the Case>Add Case Documents page, and click on the production batch uploaded in order to find the email families you wish to restore. >Then export the log to an Excel spreadsheet (Export>Export Log To Excel) and customized the load file you exported adding to the spreadsheet the column headings 'Bates Begin' and 'Parent Bates Begin'. -'Bates Begin' equals ProdBeg, Beg Bates, BEGDOC and StartBates (see screenshot above Column A'). Please Rename it to 'Bates Begin' title! Please note that you can also obtain the fields required in Excel from Lexbe eDiscovery Platform productions to restore the email families. >Upload the loadfile to the case. * Here is a sample of a file mapping Excel spreadsheet including email families. * Here is a sample of a Production ready to be uploaded. We recommend that you use both sample files to get familiar with the Upload Production/Loadfile process in Lexbe eDiscovery Platform. We automatically create a normalized PDF for viewing (or a placeholder if we cannot). TIFFs can be created as part of a production. >When creating a custom list for sorting in Excel, be careful to extend selection to the 'DocID' field in order to avoid corrupting the data. >Keep a backup copy of each Excel Metadata you import to Lexbe eDiscovery Platform (save to your desktop). This will help you to restore the database if you accidentally imported or associated metadata to the wrong files. >Make sure you show extensions for known file types in Windows, to see the file extensions type at the end of the file name. You can turn on 'File Extensions', under the options properties dialog box from the Control Panel. >If necessary disable 'Document Inspector' in the Trust Center to avoid warning messages or prevent format changes in Microsoft Excel. >You can safely delete the original file (e.g. 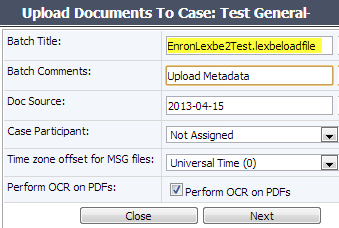 'EnronLexbe.lexbemultidocupdate.xlsx') from the case after the metadata have been populated into the database. >Lexbe eDiscovery Platform supports the two most recent versions of Excel for Excel integration (2010 and 2013) and we recommend an upgrade from previous versions of Excel before you importing metadata. Please note that depending on which version of Excel you save your spreadsheet the format of the hyperlinks in the first column might cause the import to not recognize the Doc Id value. You can avoid this issue by removing the hyperlinks from the Excel file prior to import. This is done by selecting Column A, right-clicking on the column and selecting 'Remove Hyperlinks'. Multi Doc Edit >Code selected documents simultaneously from the Browse & Search Pages. >Cases not requiring extensive and complex coding. Upload Metadata >Modify existing coded data or tag multiple tags using an Excel spreadsheet uploaded to a case. >Big cases with complex and extensive metadata. Multi Doc Edit >Multiple documents can be tagged simultaneously. >Practical review tool for small subset of documents that can be coded directly in Lexbe eDiscovery Platform. >It does not required specific users with 'Power Upload' privileges. >Only can apply coding to one field at a time. Upload Metadata >Multiple documents and coding field can be edited simultaneously by uploading an Excel spreadsheet properly formatted. >It requires advanced Excel skills, otherwise coding data for documents can be lost. >Excel spreadsheet must be created meeting the requirements listed under our 'Cautions for Use-Support'.